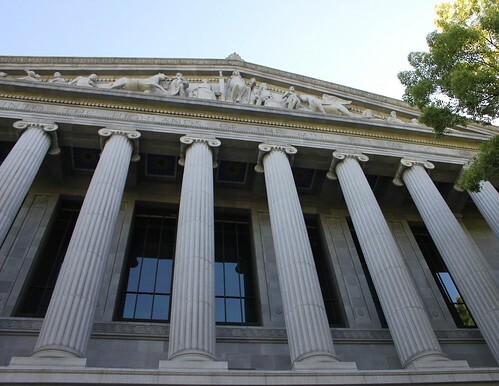 After years of funding shortfalls and delays, Governor Brown’s proposed fiscal year 2018–19 state budget holds good news for California’s courthouse construction program, including a commitment to fund the construction of 10 new courthouses. Under the proposal, the state would pay for construction by issuing lease revenue bonds, with the debt repaid by the state’s General Fund. This is a departure from recent practice, where court construction projects were funded through fines and fees levied on court users. “This budget proposal would not only fund critically needed court construction projects, it is an important acknowledgement that our branch can no longer finance court services and construction projects on the backs of court users,” said Martin Hoshino, the Judicial Council’s administrative director. Judicial branch leaders continue to advocate for the proposed funding to be included in the final state budget to make sure all Californians have safe and secure access to the court system. Read on to learn more about the progress made and what is still to come. What is the current state of California’s courthouses? For many years, courthouse conditions varied greatly from county to county. Upkeep depended on how well each county kept up its courthouse or found money to build a new one. Access to safe, efficient, and accessible court facilities was not equal statewide. However, landmark legislation (SB 1732) in 2002 authorized the transfer of title and all management responsibility for court facilities from the counties to the state. This transfer of responsibility also put the state’s judicial branch in charge of building new courthouses to replace or renovate facilities that are outdated, inefficient, and often dangerous to the public. 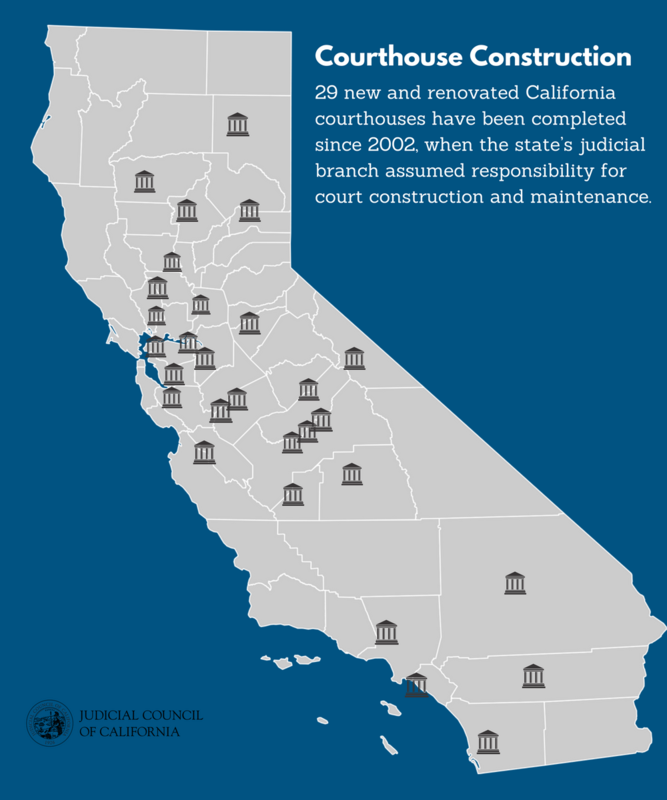 Since then, the branch has overseen the construction of 29 new safe and accessible court facilities around the state, improving access to justice for millions of Californians. This photo album above has photos of the 29 new and renovated California courthouses completed since the state’s judicial branch assumed responsibility for court construction and maintenance in 2002. You can also view the photo album and captions on Flickr. How did the judicial branch decide on which courthouses to replace? By 2003, the Judicial Council had collaborated with courts and county governments in all of California’s 58 counties to create facility master plans for each court. In 2005, the council produced its first infrastructure plan, which documented the urgent need for upgrading the state’s courthouses. The council submitted the plan to the California Department of Finance to give context for funding requests on specific projects. From 2005–2007, the judicial branch received funding under SB 1732 to start some of those new courthouse projects. How are the most recent courthouse projects being funded? In 2008, another law (SB 1407) launched an unprecedented courthouse rebuilding program in California by authorizing up to $5 billion in lease-revenue bonds (to be repaid by court user fines and fees) to finance new construction and renovation projects. Soon after, the Judicial Council approved more than 40 projects in 34 counties to be funded by those revenues. Why aren’t all the approved courthouse projects completed yet? The state’s fiscal crisis caused many construction projects to be cancelled or delayed. Since 2008, more than $1.4 billion in court user fines and fees originally designated by the Legislature for court construction were borrowed, transferred to the state’s General Fund, or redirected to help fund court operations. What did the judicial branch do when funding for court construction was reduced? In 2011, the Judicial Council canceled two courthouse projects and directed $300 million in cost reductions on all others. In 2012, the Judicial Council indefinitely delayed seven courthouse projects. In 2013, the Legislature directed that court construction funds pay for the new Governor George Deukmejian Courthouse in Long Beach, rather than money from the state’s General Fund as had been originally planned. As a result, the Judicial Council had to indefinitely delay four more projects, leaving a total of 11 projects indefinitely delayed. What is the status of current courthouse construction projects? Of the approved projects, 17 are in various project stages (site acquisition, design, etc.) and 10 are indefinitely delayed until further funding can be identified. There are no reserve funds; all SB 1407 construction projects can only move forward beyond their current phase if further funding is authorized by the Legislature and state Department of Finance.